1. Select Admin > Import. The Import Scene(s) dialog box appears. 2. Any supported Stage file can be imported, including IEContents.dat files. The IEContents.dat file includes database and scene file information. Specify the path of IEContents.dat for the scene(s) you want to import. 3. 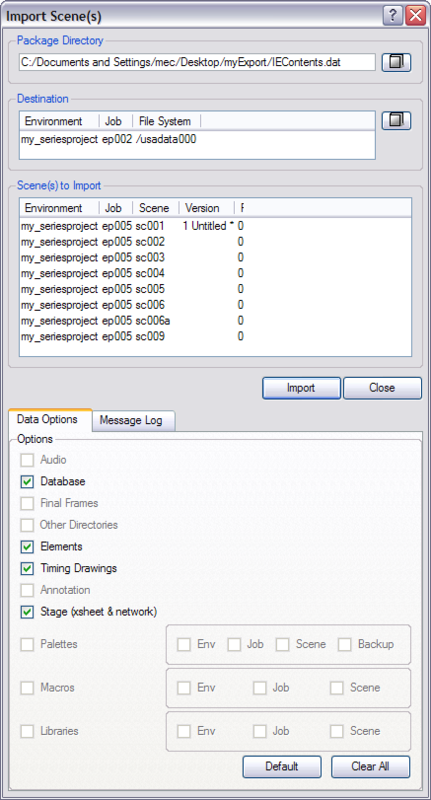 Click the Browse button to select the environment, job and file system where you want to place the imported scene. 4. If you want to import only some of the scenes in the Scenes to Import list box, select the scenes. If no scenes are selected, all scenes will be imported. 5. In the Data Options tab, select what you want to import (the selections steps 5, 6, and 7 are described in the corresponding steps of the export procedure in the section, Exporting Data). 6. In the Advanced Options tab, select how you want to import the scene. Select one of the option each in the Valid Links Options and the Broken Links Options panels. If the scene already exists, the Scene Exists dialog appears. Click either Import Scene for each scene or Import All Scenes to confirm your selection. If you are importing scenes that were exported from the Harmony Network, or worked-on in Harmony Stand-alone, the system will try to retrieve the version name.